The Bulldog building is over 100 years old! Thanks to the Stumptown Historical Society and helpful old timers around town, we know quite a bit about the colorful history of this building and its various incarnations over the past century. Built in 1903, the building was originally named the Dodge House. During the early 1900’s, it was called Houston’s Hall after Dr. Houston, a railroad doctor and surgeon who had offices on the second floor. The second floor was later occupied by other doctors- occasionally used for boxing matches-and also served as a meeting place for Masons and other fraternal organizations. During this same period, the primary business on the main floor became known as the Pastime Pool Hall, which was later owned by various members of the Akey family for nearly 50 years. In addition to pool, the Pastime was the place to go for card games such as poker, pinochle and pan. During the prohibition era, the Pastime survived selling everything from guns, fishing tackle, batteries, and work gloves, to tobacco and cigars. There was even a soda fountain for teenagers located in the basement during a short period following World War II. 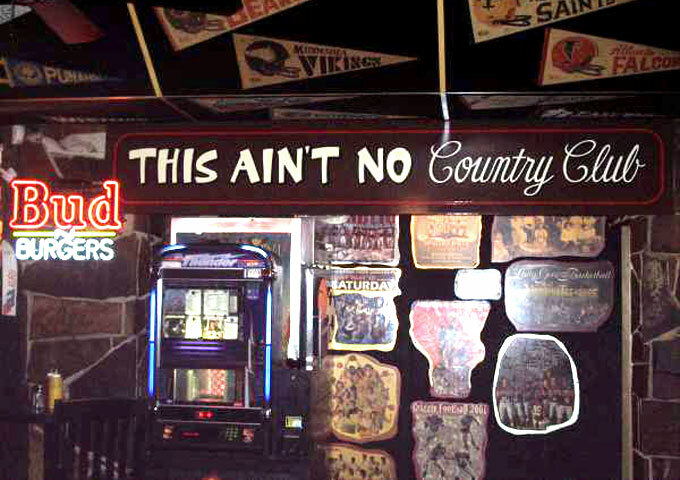 It was known as the Pastime until the late 70’s when it was purchased and renamed Yeti’s Den for a few years. 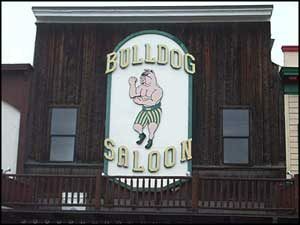 Buck and Linda May bought it in 1983 and renamed it the Bulldog Saloon in honor of the Whitefish High School mascot. The next generation of Mays, Eric and Amy, run the family-owned business these days, with help from their son, Jake (and sometimes Luke). Now known as a fun sports bar with great burgers, the Bulldog continues to be a fixture in downtown Whitefish. As the late Earl Hunt, Pastime bartender for 28 years, told the Whitefish Pilot in 1979, the Pastime served the townspeople as a place “for socializing, a little imbibing, card playing, but has never been a rough bar.” That’s the way we like it—enjoy, and thanks for visiting us at the Bulldog!